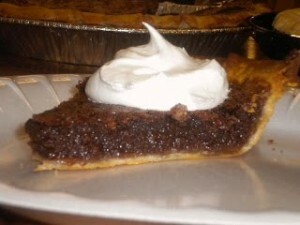 This is the recipe for Chocolate Chess Pie, and it’s so incredibly easy. You just throw a bunch of ingredients in a blender and then pour the mixture into prepared pie crusts (you can use pre made refrigerated or frozen pie crusts) and It’s real easy. Serves 12 that’s 6 slices from each pie, It makes 2 pies. Directions: Preheat oven to 350 degrees. Put first 6 ingredients in a blender and mix well. Pour into pie shells and bake 35 to 40 minutes or until the top of the pie has puffed up like a soufflé. The center will still be shaky when the pie is taken from the oven. Do not over bake. Serve with whipped cream. To make homemade whipped cream pour 1 cup ice cold heavy cream into chilled mixing bowl, add 1 to 2 TBS of confectioners’ sugar and beat with whisk beaters until peaks form. Directions: You can use your mixer, food processor, 2 forks, or a cutter tool, Blend the first four ingredients until a crumbly, cornmeal-like consistency has been achieved. Beat together egg and vinegar until it is all combined and then add to your dry ingredients, add only enough water so that mix is well moistened and it is dough like it may be sticky but not too much. It’s ready when it pulls away from the sides of the bowl. I usually use my hands to combine the dough. Mold the mixture into a ball, cut it in half, wrap each half in plastic wrap and chill in the refrigerator for 15 to 20 minutes. Roll out dough on a lightly floured surface to a circle a little bit larger than the pie plate you will be using. Do not stretch your dough. Turn under the overage all around the edge and crimp. Now it’s ready for the filing. Dough may be refrigerated for three days. 2. Cut the Phylo pastry into squares, brush each square with butter then stack three of them together overlapping them at right angles to each other. 3. 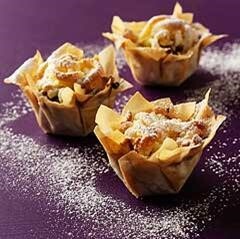 Push the pastry stacks into the base of a 24 hole mini muffin tin. your only limitation on these.